The Business Bay bridge is the most recent bridge over the Dubai Creek. The 13 lanes Business Bay crossing opened 10 years ago... yes that is right, seems like yesterday! 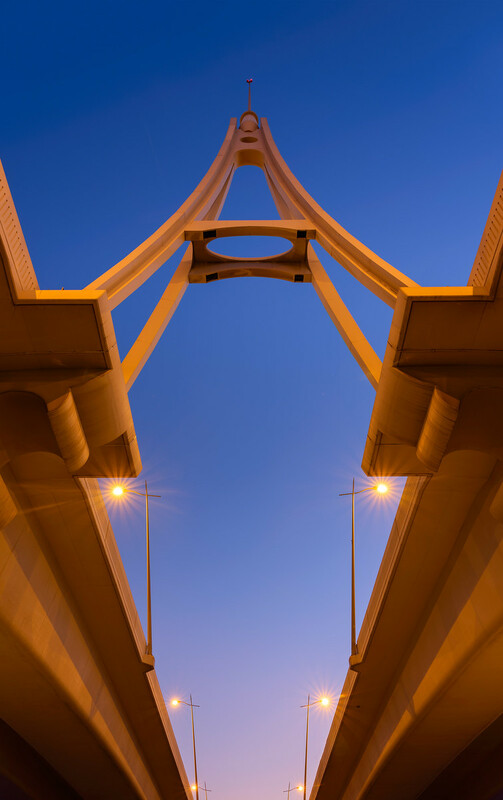 Over the last 10 years I made quite a few images from below the bridge (on the Deira side - new part of Dubai); a popular spot for architectural photography, especially during the blue hour. Click here to see some of these images. The image below shows what that view looks like! I was especially attracted to the complementary colours of the evening sky with the warm yellow of the fully lit bridge. Although I personally prefer the overall handling of the smaller Fujifilm cameras like the X-T2, I do appreciate the image quality coming out of this new Medium Format mirrorless wonder from Japan! The files are very clean and have heaps of detail. Especially for somebody who is used to the X-series system, the learning curve is actually very shallow; you really feel right at home after a matter of minutes. I will be blogging more images shot with the GFX 50S over the coming weeks; rather than doing a full review, this will hopefully show people how the camera performs in the field! Last week I finally got my hands on Fujifilm latest camera; the GFX 50S, a +50Mpx Medium Format camera, which got a lot of attention when it was announced at Photokina 2016! Although the camera is much larger (and a bit heavier) than my X-T2, it remains "portable" and feels pretty much like carrying a Canon or Nikon full frame DSLR around. Obviously with the advantage of having a sensor which is 1.7 larger than full frame and with a higher resolution of most! Even though the GFX is the start of a brand new lens system for Fujifilm, three lenses were available (two primes 63mm f2.8 and 120mm f4.0, one zoom 32-64mm f4.0) on the day the GFX 50S was available. More lenses will be released in the second part of 2017. Right now it looks like I won't be doing a "First Look review" on the camera, as I would rather like to concentrate on the Fujifilm X-series cameras instead; these by the way will continue to be developed with new lenses and bodies to be released in the future. The GFX Medium Format system would be great for my Architectural and Landscape photography; something I would like to explore during the 10 days I have the camera available. One of the very first shots I took with the GFX 50S, was the rooftop shot below, made early morning in Dubai from one of the high-rise buildings along Sheik Zayed road. Special thanks to a Dubai photographer friend who organized the access to the spot. You'll know who you are! Make sure to click on the image below to really appreciate the full resolution of the +50Mpx file. Although I'm not a pixel peeper, one can almost not resist to zoom in to 400% or so, and read road signs and other tiny details. Please check out the excellent GFX review done by fellow X-Photographer Jonas Rask here. More Architectural shots from Dubai can be found here. Lastly, the image above is my 1000th post on Instagram! Only been on it for two years, the follower ship has grown a lot organically (not by paying companies to get me followers!). Today it is by far my preferred Social Media network for my photography. If you don't do so already, make sure to follow me on Instagram here. Remember: "Wake up with determination, go to bed with satisfaction". The Fujifilm Instax Share SP-2 printer, replaces it predecessor the SP-1. 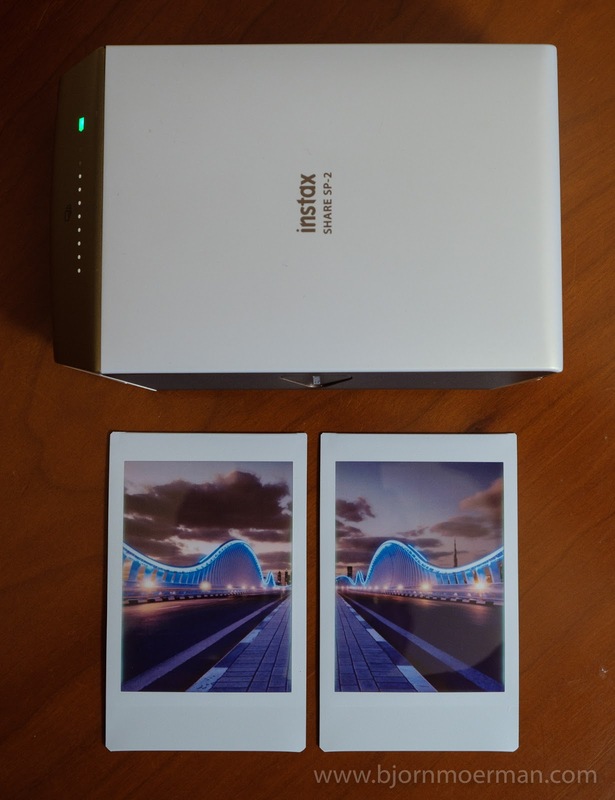 Although not brand-new (released June 2016), the first time I used this pocket Instax printer, was during the recent 24 hour project in Dubai on April 1st. 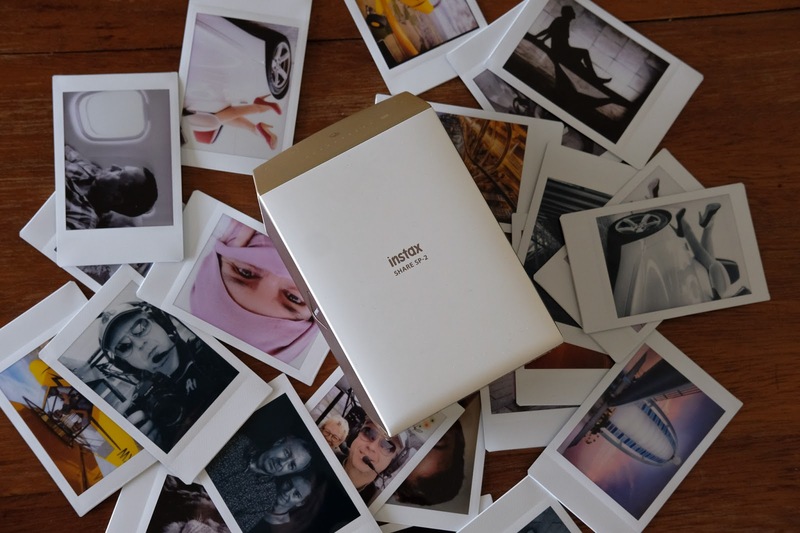 With its portable size and weight, the Instax SP-2 is the perfect pocket printer to be taken on the road. 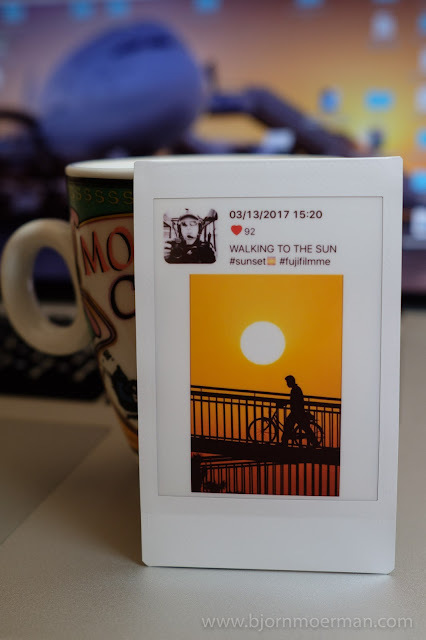 If you want to make small credit card prints to give out at weddings, birthday parties or even on Street Photography walks, the SP-2 is what you are looking for! Before we go any further, you are not limited to using Fujifilm cameras in order to use this device. The Wifi enabled small printer, comes in two colours (silver and gold) and is slightly smaller and lighter than an X-T1/2 camera body. 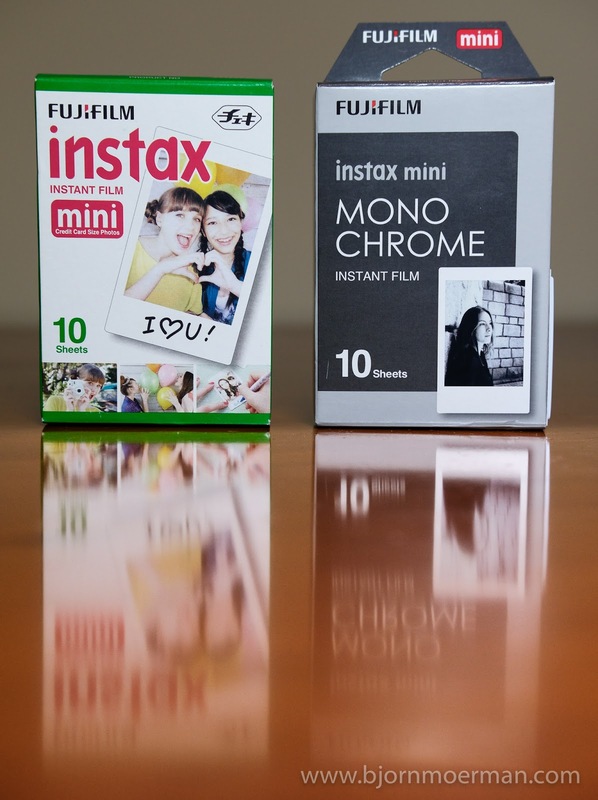 It takes both the Fujifilm Instax mini film as well as the brand-new "Monochrome" Instant film, for better Black and White prints (see below Image quality). For the ones that are too young to know what polaroid cameras look like, there are no ink cartridges in the printer itself; the image is developed right on the paper! Loading the film is dead easy; after unzipping the bag, just align the yellow dots and you are done. There are only two buttons on the device; one power button and a "Reprint" button on the side. The second one is to be used if one wants to print the last image again. On a few occasions, I did press the button, which lead to an unnecessary print being made. In the future, the button could potentially be better guarded against accidental use or placed in the a different spot. Next to the slot, where the photographs come out, there is a battery indicator light as well as a series of small white LED's, showing how many of the max 10 slides are still available in the installed film cartridge. Unlike its predecessor, the SP-1, which held two CR-2 batteries, which are not always easy to find, the new one uses a Fuji NP-45 battery, which is also used on some of its smaller compact cameras. One full charge will last about 100 prints, which is plenty for a device like this. If needed one can recharge the battery through USB (micro USB cable) or in a dedicated battery charger which is not provided in the package. 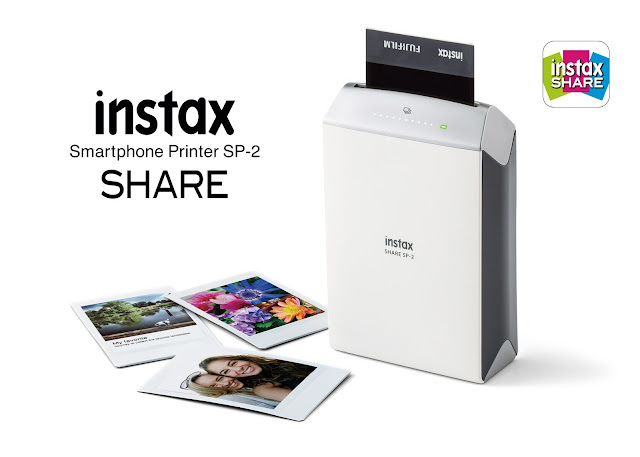 Your main interface to start printing is the "Instax Share" app available for iOS and Android phones and tablets. Once the image is on the phone or tablet, one can directly print from the application as long as the Wifi connection is established not the phone/tablet. I did find the wireless connection easy to set-up and very stable. The app has some basic image editing sliders and allows you to print directly from Social media like Facebook and Instagram. Below is an image printed directly from Instagram. On the app, one can also choose from a large variety of print templates, including some seasonal ones like a Happy Birthday, New Year and Valentines one. Not something I personally would use every day, but still fun nevertheless! Another interesting one is the "split image"; it will print two photos of a single image split in two; creativity at its best! Just be careful that you still have a minimum of two useable slides left in the printer before starting the split image print. Alternatively one can also print directly from one of the many Fujifilm Wifi enabled X-series cameras. 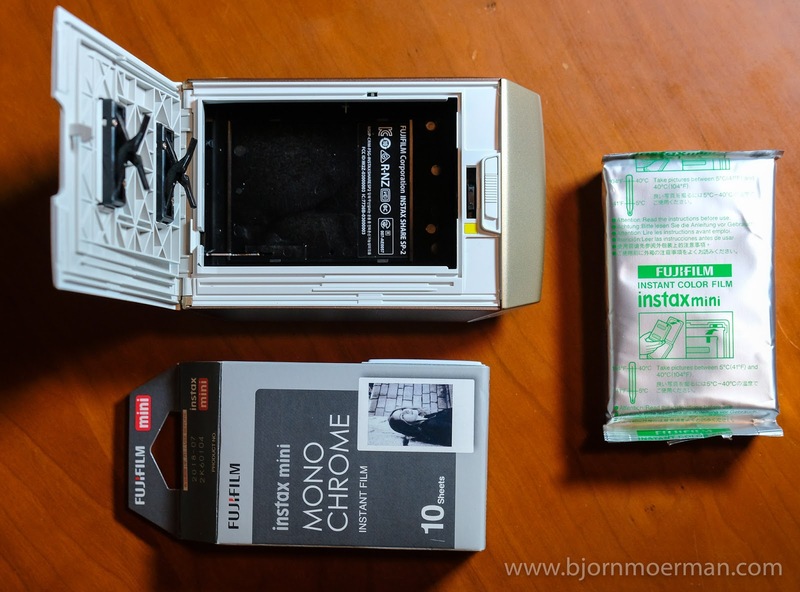 I haven't tested it, but I suppose even printing from the brand-new Medium Format Fujifilm GFX camera should be possible... it might however be a bit overkill! It takes about 10s (compared to 16s for the SP-1) for an image to print and then another 5 mins before the image is fully developed. There is still something nostalgic about the wait for the image to appear! 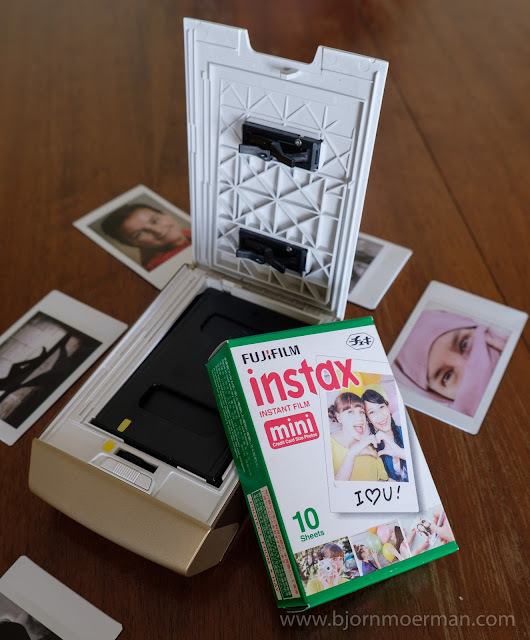 For the ones going back to the polaroid days, there is absolutely no need to shake or wave your Instax print, just let it sit for a few minutes and you are done! While the older SP-2 was limited to a resolution of 640x480px at 254dpi, the new model manages 800x600px at 320dpi. While the images of these small print might not be the sharpest you've seen, one is missing the point if that is your main priority! It is all about being able to share a moment with the people around you. 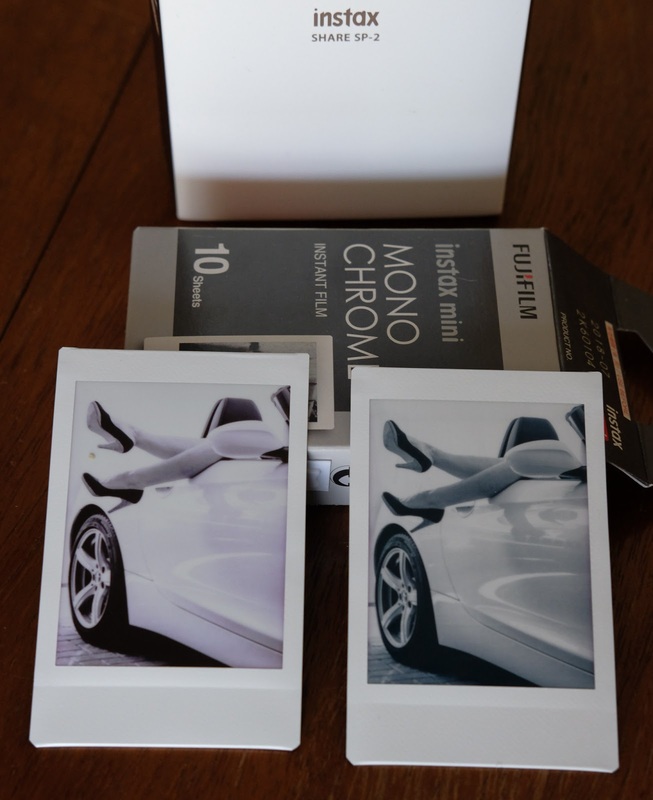 When printing Black and White photographs, I strongly recommend using the Fujifilm Instax Monochrome film. Using Color film often shows a bit of a warmer color cast as can be seen in the image below (left is printed on the standard (colour) film, right one on Monochrome film. Today the SP-2 sells for about 160,-USD in the US and just under 200,-EUR in Europe; prices in the UAE seems to vary somewhere in between. The device does normally not come with Instax Film packs included. Standard price for a pack of 10 slides is about 10, USD, making it 1,-USD (1,-EUR) per image. However when shopping around, one can easily find larger combined packs which bring the price per image down to about 60 cents. 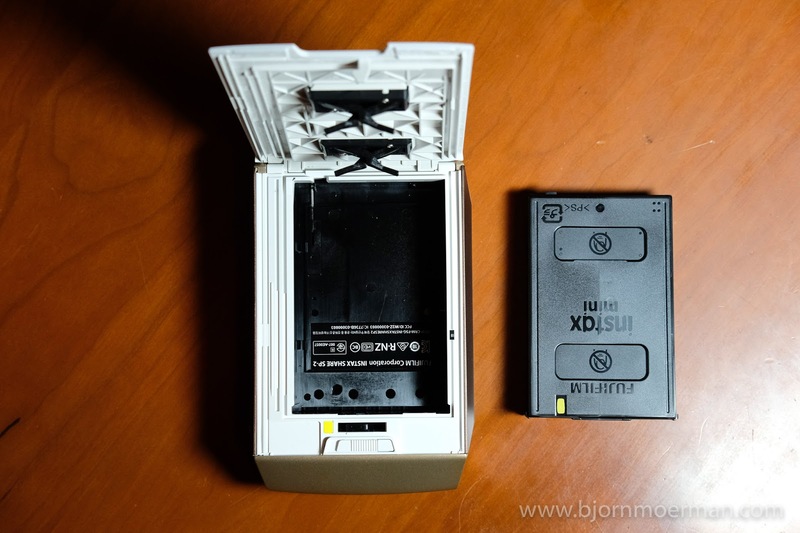 WHO IS THE INSTAX SP-2 FOR? I doubt it the printer is aimed at only one type of photographer; any photographer who likes to share small printed images on the go, is potentially in the market for a pocket printer like the SP-2. The retro feel of the instant image, is something that both young and old appreciate. Wedding and other event photographers are probably the largest group of potential buyers of the SP-2's, but I can also see some Street and/or Travel photographer wanting to bring one to a shoot. In any case, there is something to be said about the look on the face of whoever has never seen Instax film develop! 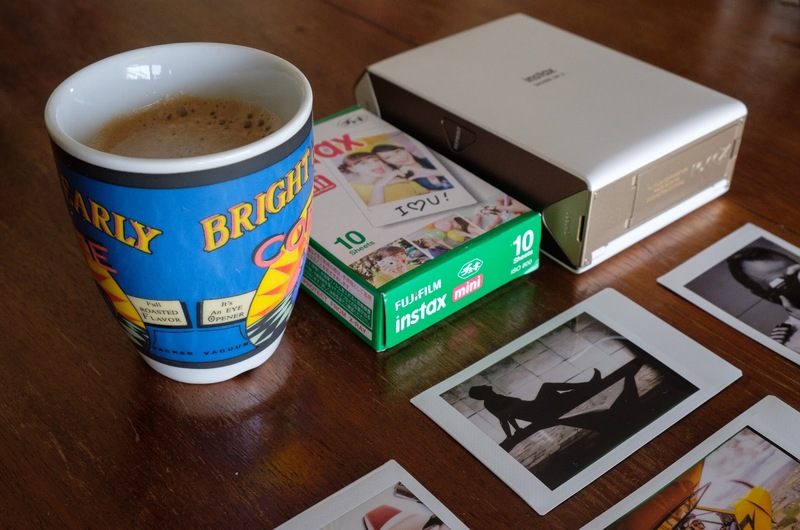 If you are in the market for a small on the go instax printer, look no further! After all, remember: "A picture is not a photograph until its printed"! As, I'm presently working on an article for Fujilove magazine (June edition) about my Aerial photography with the Fujifilm X-series, I first wanted to share a recent birds-eye view of a snowy Turkey with the blog-readers. 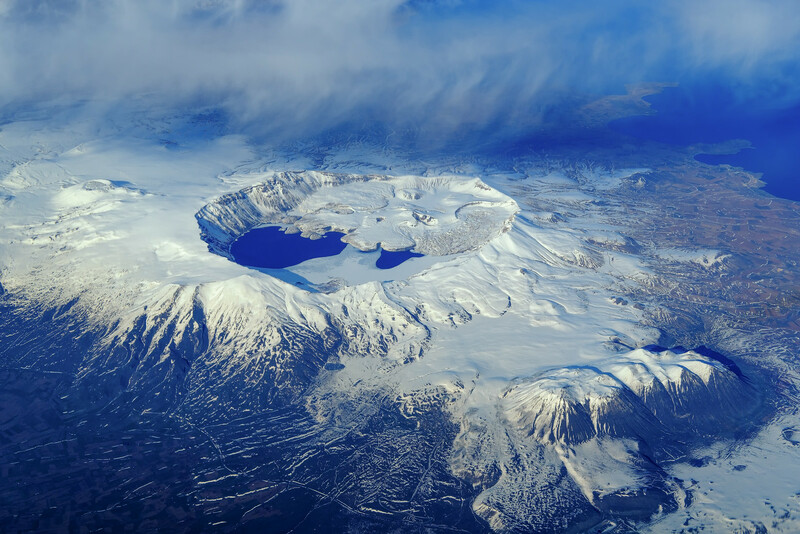 The image below shows a dormant volcano near Lake Van in eastern Turkey; a beautiful site which we often overfly on the flights between Dubai and Central Europe. Especially in winter time the scenery is often breathtaking! Before some clever pixel peeper comments on the softness of some parts of the image.... this image is shot through several layers of an airliners window; the softness is the direct result of the this, not of the lens! But remember: "There is nothing worse than a sharp image of a fuzzy concept" - Ansel Adams. More of my Aerial photography can be found here. For me and for a lot of other fellow Street Photographers, April 1st was a day to remember. It was this time of the year when close to 4000 photographers documented Human life in more than 800 cities around the globe, all for a good cause; creating awareness for refugees all over the world and more specifically for @LesvosSolidarity in Greece. More info can be found in a blogpost of mine from last month; click here for more. I can proudly say that I've successfully completed the 24 hour project challenge beside 7 other Dubai photographers. Another 16 participated for part of the event with some of them coming very close to meeting the complete challenge, often being just a few images short. The image below was shot on a hot (37C) afternoon, after I had been shooting for about 17 hours. 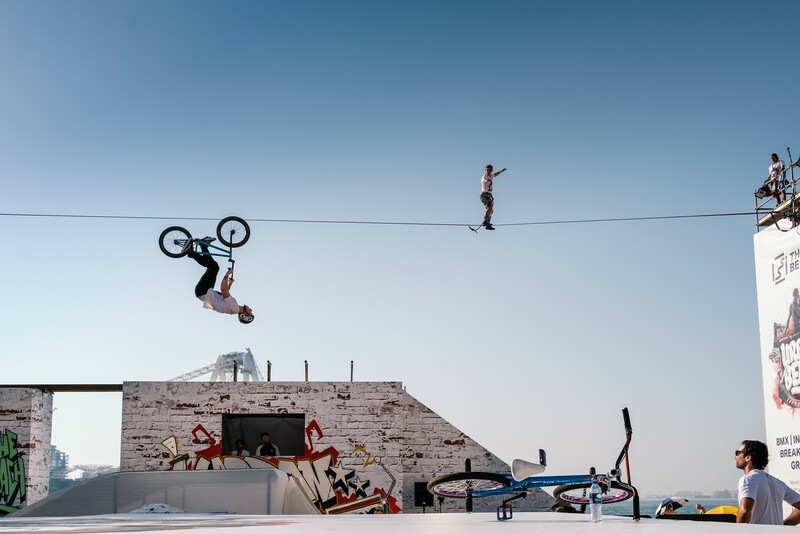 The scene is part of the "Urban Beats at The Beach" event; a free 3 day event bringing Xtreme sports, DJ spins and Graffiti artists together at the Dubai Marina beach. Lately I been inspired a lot by the work of Magnum Street Photographer Alex Webb; who is often known to frame images in different layers; allowing the viewer to stay in the image and discover new things in the process. I hope the image above provides you with a similar viewing experience! The 24 hour project has been challenging but also very rewarding! It is undoubtedly one of the more demanding things I've done photographically speaking. The fact that one has to meet 24 different deadlines, while being tired but also remaining creative, is not to be underestimated. While a project like this is generally speaking not there to create award winning photographs, I'm quite happy with the 24 final images I came up with. Click here to check out the gallery set up for the event. To me the main key to success was keeping the gear to the absolute minimum; I personally used a Fujifilm X-T2 with two small, lightweight lenses; the 23mm f2 and 35mm f2. Having built in Wifi was a huge advantage in order to get the images up on social media without loosing valuable time. Remember: "THE ULTIMATE INSPIRATION IS THE DEADLINE" - Nolan Bushnell.